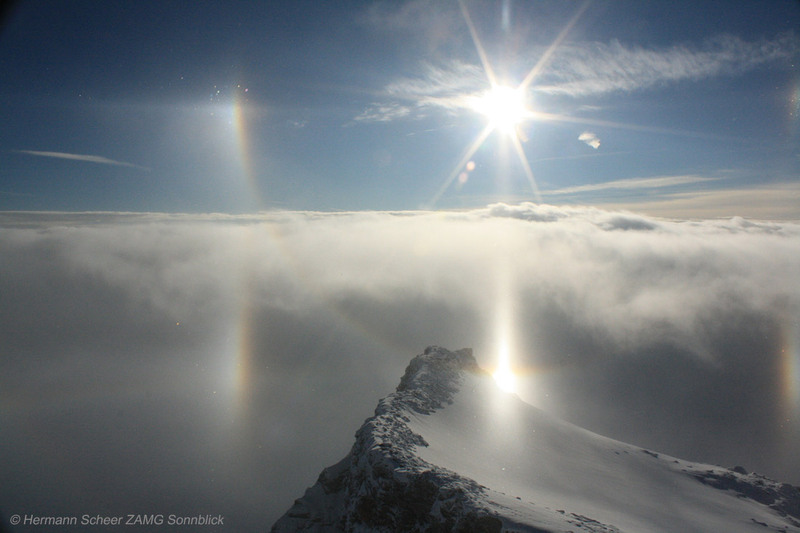 On 18 October 2010 a superb diamonddust halodisplay was observed at the meteorological station Sonnblickobservatorium ( 1 ) in the Austrian Alps (3106 m, 12°57’ E, 47°03’ N). 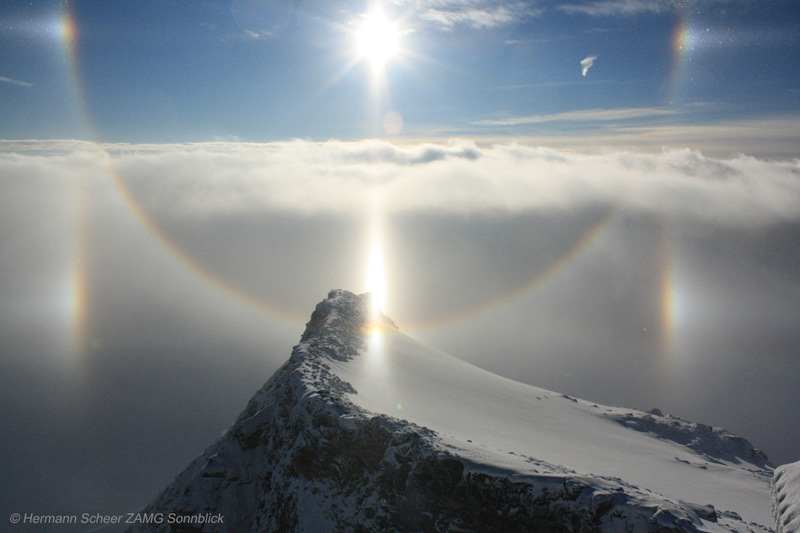 Hermann Scheer, member of the meteorological team at the observatorium, took images of 13 different haloforms between 08:30 and 09:00 CEST (06:30 and 07:00 UT): parhelia, 22°-halo, 46°-halo, lower tangent arc, subsun, subparhelia, infralateral arc with Parry-infralateral arc, supralateral arc, parhelic circle, subparhelic circle, subhorizon Wegener arc and helic arc. ( 2 - 3 - 4 - 5 - 6 ) The images were taken at a sun elevation of 8,9° to 10,3° between 08:31 and 08:40 CEST, the file names indicate the exact time. 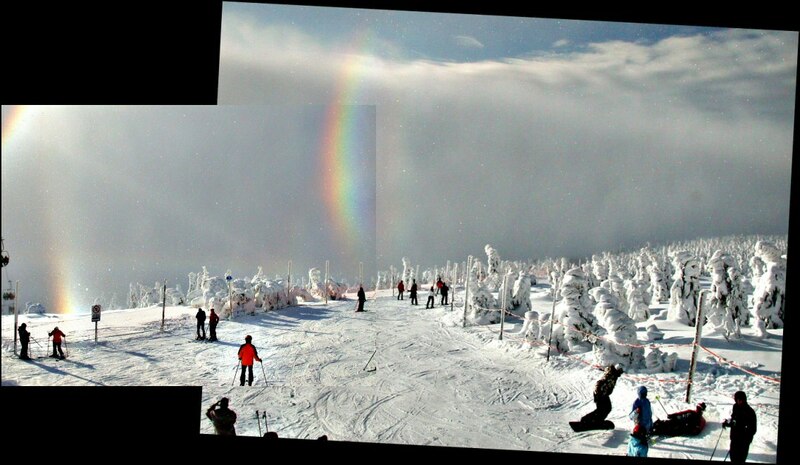 The brightness of the Wegener arc was incredible. Very interesting is the combination of Parry-infralateral arc with infralateral and faint supralateral arc. 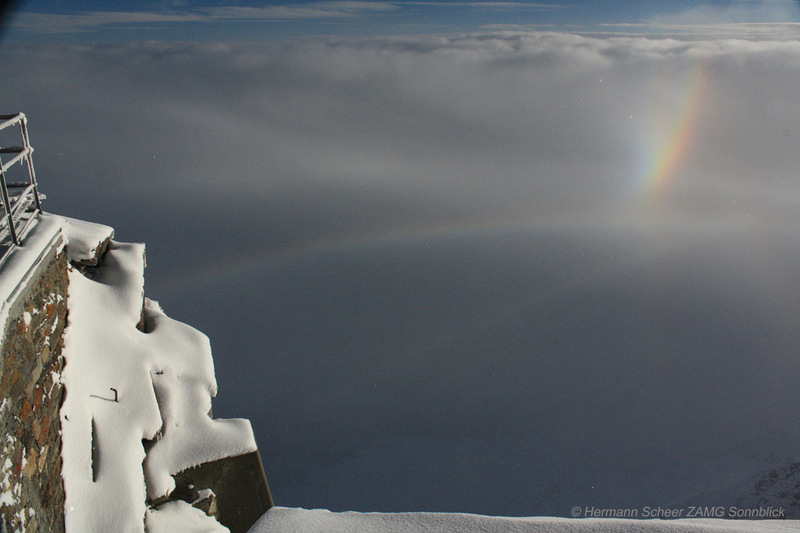 This part of the phenomenon is similar to an observation in the Czech Republic (26th of December, at Lysa hora in Krkonose (Giant Mountains)), described at Optické Úkazy v Atmosférè ( 7 - 8 ) Thanks to Tomas Trzicky for the links. 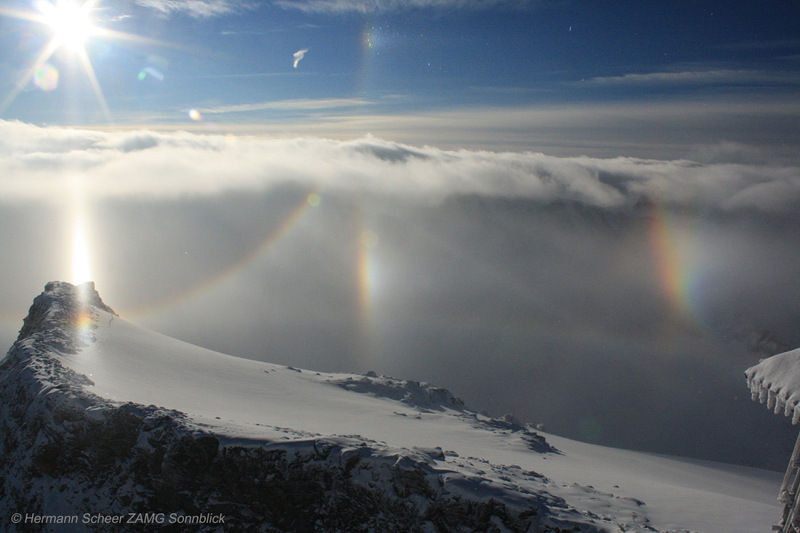 And also in Ice Crystal Halos ( 9 ). In this very small area of the display we can see a 46°-halo, Wegener arc, helic arc and the subparhelic circle too. The display was observed at the upper boundary of the stratiform layer; weather conditions: 06:00 UT - air temperature -6,8°C, air relative humidity 96%. !!!! 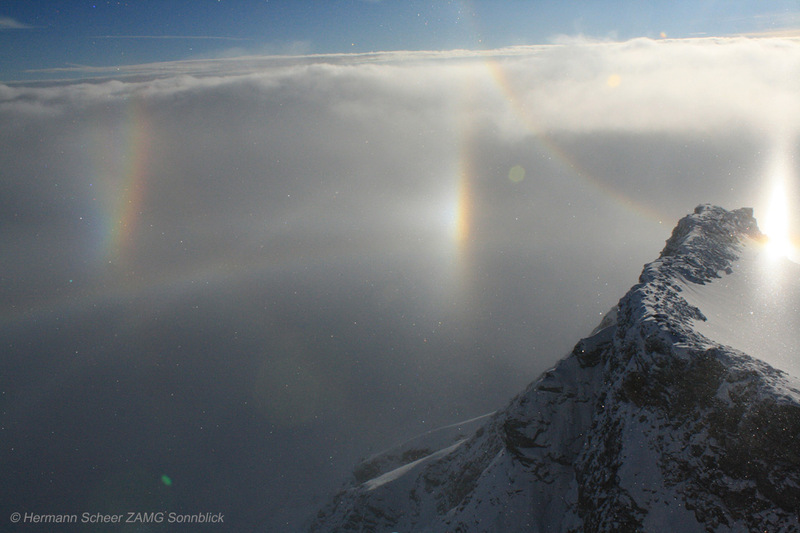 The Alps opened this season of diamond dust. What a start! I don't remember seeing such strong and colourful Wegener before. Nice display! Very clear arcs. 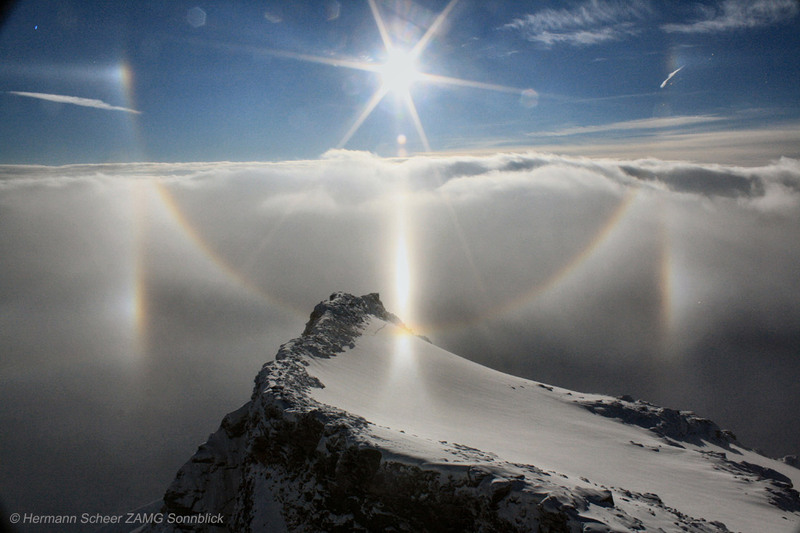 Yes very nice clear arcs indeed!! Love to see that around a spotlight at night who knows there could be hastings in spotlight. I'm still thrilled that I have succeeded in these recordings. With a clear view in all directions much is possible. I know those are some nice halos you got there I would of gone crazy and would of filled my camera with pics. The Tape arc here consists actually of two overlapping Tape arc components, of which the other one has not been photographed before in natural light conditions and only once with spotlight. All together there are four Tape arcs, of which two are theoretically tangent to the supralateral arc and two to the infralateral arc. In this photo we are seeing the sum of Tape arc lower components of supra- and infralateral arcs. Now I don't know if this makes sense to anyone, should probably make clarifying simulations and figures.